The families of two teenagers killed in a school coach crash in Cumbria have paid tribute to a "fantastic daughter" and a "fun-loving boy". Chloe Walker, who died on her sixteenth birthday, was "beautiful and talented" and "stood out in a crowd", her family said. Kieran Goulding, 15, was described as kind, caring and loving. The driver of a Honda Civic, Patrick Short, 68, was also killed in the crash on the A66 near Keswick on Monday. The 49-seater coach was taking pupils home from Keswick School when the crash happened. Eight children remain in hospital - one known to be in a serious condition - and 25 other people, mainly children, were injured. The coach driver, a 63-year-old man from the Egremont area, is described as being in a "comfortable" condition at the West Cumberland hospital. A spokesperson for the Goulding family said: "Kieran was kind and caring, loving and sharing, which was the meaning of his name. "He was a fun-loving boy, full of life and lived life to the full. "He was loved by all." 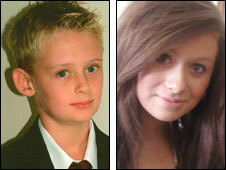 Chloe's parents Sharon and John Walker said: "Chloe was a fantastic daughter. "She was vibrant, beautiful, talented and a very witty young lady. "She was creative, artistic and stood out in a crowd. "How could someone so precious and loved so dearly be taken away so young and on her birthday?" Her death was the second tragedy to hit the family. In 2007 Chloe's brother Jordan died from the degenerative condition Sanfilippo syndrome. Mr and Mrs Walker added: "We're sure you will be holding Jordan close and he will be getting those lovely hugs and kisses on the head that Mam and Dad are missing." Police have asked people not to attempt to leave floral tributes at the crash scene. Crosthwaite church in Keswick and nearby Braithwaite church have opened to receive flowers.